Welcome to Marvel Strike Force Minions page. This is the full description of MSF S.H.I.E.L.D. Operative stats, skills, and abilities. In Marvel Strike Force, S.H.I.E.L.D. Operative is a S.H.I.E.L.D. (Strategic Hazard Intervention Espionage Logistics Directorate aka S.H.I.E.L.D. is a fictional counter-terrorism agency led by Nick Fury which employes espionage and law-enforcement in its work) minion who can infuse injured allies with stealth and slow enemies. S.H.I.E.L.D. Operative's price is 15 shards and she is obtainable through orbs and 4-3 heroic campaign mission. S.H.I.E.L.D. Operative is one of the reasons why Nick Fury is so powerful. With S.H.I.E.L.D. Operative in a team, Nick Fury is safe from attacks because if the enemy focuses on him, S.H.I.E.L.D. Operative will apply Stealth and Nick Fury will spread stealth on the rest of the team. Furthermore, S.H.I.E.L.D. Operative will clear any existing buff from the enemy and transfer it on Nick Fury. it is important to say that S.H.I.E.L.D. Medic is more useful in raids than S.H.I.E.L.D. Operative but for Blitz and Arena S.H.I.E.L.D. 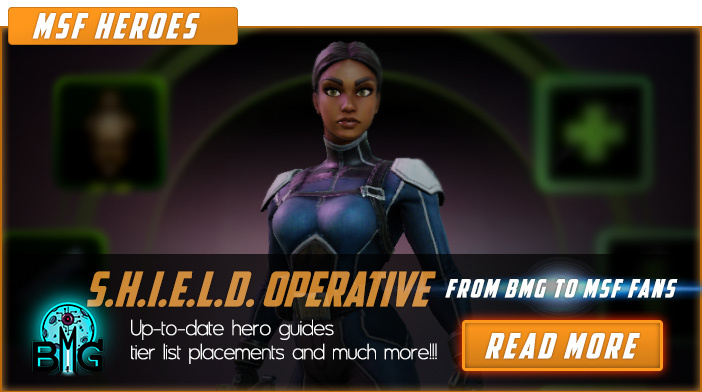 Operative is the essential part of the S.H.I.E.L.D. team. S.H.I.E.L.D. Operative is an agent who specializes in protecting vulnerable VIP's with stealth and emergency medical aid. Attack Primary target for 80% damage. On Crit, change Speed Bar by -25%. 50% chance to clear a positive effect from target + apply it on Nick Fury. Apply Stealth to lowest Health ally + heal for 10% of this character's Max Health + apply 2 Regeneration. Gain + 5% Extra Focus. Nick Fury and S.H.I.E.L.D. MINION allies gain +5% Extra Focus. On Spawn, apply Counter to Nick Fury if ally. We hope that you enjoyed the description of MSF Minion S.H.I.E.L.D. Operative. For detailed information about other MSF Characters check our MSF Minions page.